The P.1110 series was an attempt to establish the best location for airframe components in order to get best aerodynamic efficiency. One requirement was to keep fuselage cross section to a minimum. There were two basic designs; both identical from the wings forward. The biggest difference was that the P.1110/I had a normal swept tail with engine intakes on the sides of the fuselage. Meanwhile the P.1110/II had an annular intake that wrapped around the airframe and a vee or butterfly tail. Both aircraft would have been powered by an HS 011A turbojet, which would have given a projected top speed of 617 mph (993 kph). Armament would have been three to five MK 108 30mm cannon. 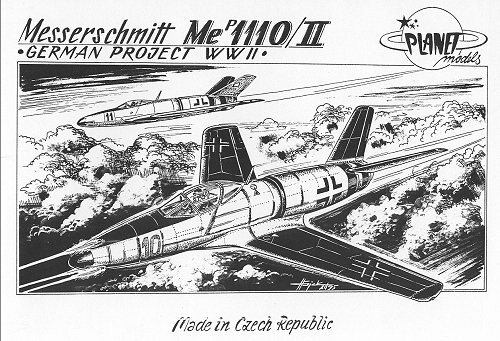 Messerschmitt's work on this aircraft must have been studied rather closely as the basic shape of the initial version is quite similar to a number of postwar Western aircraft, including the F-86, Hunter, and it especially reminds me of the SAAB J.32 'Lansen'. This kit has the packaging that is not only typical of Planet Models, but also many other Czech resin kits. There are a number of sections in a clear bag that have various parts segregated. This keeps damage due to shipment down to a minimum, though these parts do rattle around quite a bit in what is a big, relatively empty box. As you can see, the smaller parts are mostly on a resin wafer. This is great for keeping track of parts, but not so hot in terms of molding. Large, thick parts molded on wafers are much more prone to air bubbles than those on resin blocks. Especially susceptible to this problem are wheels, though this example appears to be free of this malady. 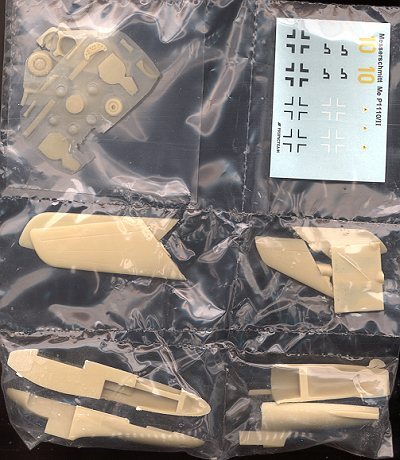 Also included are a sheet of basic insignia from Propagteam as well as a single vacuformed canopy. As I mentioned in other reviews, the addition of a second canopy is considered standard by quality vacform kit makers and I can only hope that Planet Models can start to include this inexpensive addition. The rest of the parts look well molded, though the mating edges are a bit rough and will need some cleanup. The fuselage is broken down into four sections due to the annular intake aft of the cockpit. The forward fuselage is pretty solid and finding room for weight will be a real challenge. It may require some drilling out of the area behind the cockpit to find extra room. Overall, it looks like another fine subject from Planet Models and one that should prove to be as good a build as the others I have done.